The Global Citizen is an international school located at the University of Toronto. We were approached to develop a brand new informative parallax website for the school. We worked to create a brochure like website for the school. The client wanted the website to showcase the professional photographs that were taken of the school and students in an effort to offset the descriptive text that can be found throughout the website. 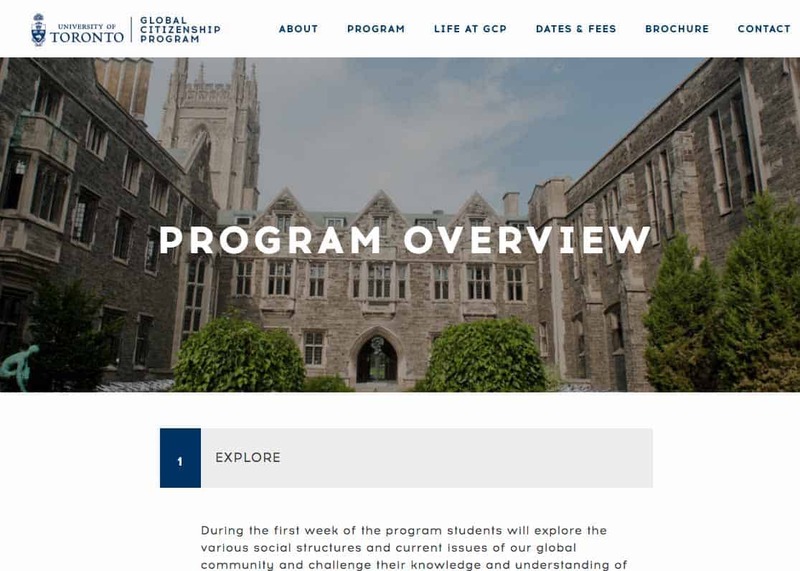 The University of Toronto Global Citizenship Program website, is a parallax style website. This type of website displays text floating over photos. A challenge of the project finding the perfect web-font that was bold, readable and wouldn’t get lost in the imagery. We were given all new content to be integrated into the new site. The challenge was organizing and balancing the design of the layout throughout the site with the content length. Keeping the end-user engaged and informed from the moment they first arrive to the site was something that had to be consistently maintained throughout the design and development process.